Origin: Southern Indica azaleas (Azalea indica) are actually native to Japan and first introduced into Holland in 1680 but failed to catch on there. It reached America in the 18th century and became popular outdoor landscape plants in the warmer parts of the South. Fruitland Nurseries of Georgia was among the first to offer the emerging varieties for sale and extensive breeding both here and in Holland has produced a wide range of forms. The name Azalea indica arose from the fact that people thought the flower was of Indian origin. Description: Azalea indica ‘Inga’ is a wonderful shrub for planting in under light, shade trees where the many flowering pink and white add a seasonal splash of colour. Ideal pot plant for shaded balconies. Evergreen compact shrub about 60-90cm (23-35 inch) tall that thrives in acidic soils. Flowers in spring and spot flowers summer/autumn. The semi-double flowers are ruffled pink with white edge. Position: Azaleas prefer cool, partially shaded sites, such as the filtered shade of pine trees. Azaleas planted beneath hardwoods with shallower roots must compete with these trees for nutrients and water. If placed in the right location, however, they can do well on these sites. Although some varieties tolerate sun better than others, they all prefer an area that is not exposed to long periods of hot full sun and drying winds This causes the leaves and flowers to fall off azaleas. Flowers last longer when plants are partially shaded. 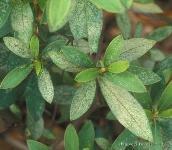 Azaleas exposed to full sun are more susceptible to lace bugs. Early morning sun exposure after a hard freeze may cause cold injury. Do not plant azaleas in heavy shade as poor flowering and weak growth result. 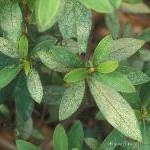 Cold can blackened or severely discolored foliage. Soil: Azaleas are shallow-rooted plants that are easily damaged by excessive soil moisture. They grow best in acid (4.5 to 6.0 pH), well-drained, organic soils. Before planting, have the soil tested and adjust the pH according to soil test results. Azaleas located in poorly drained sites do not receive the oxygen required for healthy growth and often develop root rot diseases. When planting in poorly drained areas, add composted pine bark to as large an area as possible, and plant the root ball higher. Mulching: A 5-7cm (2- to 3-inch) layer of organic mulch is very important. It conserves soil moisture especially through the hot summer months, maintains soil temperature and helps discourage weeds. There are many materials suitable for mulching: pine straw, composted pine bark and leaves work very well, enriching the soil with organic matter as they decompose. Keep the mulch 5cm (2 inch) away from the main stem to keep the bark dry and extend it beyond the outermost branches. Watering: Azalea indica ‘Inga’ are shallow-rooted plants and require irrigation during dry periods. This is especially true of those planted in the spring. 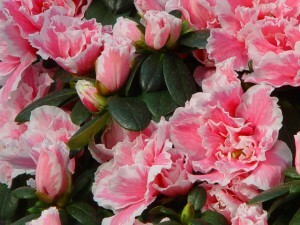 Azaleas planted in warm weather in sandy soils may require watering of the root mass twice a week during the first year. To determine when to water, pull back a small area of mulch near the base of the plant and check the moisture level of the root ball and surrounding soil. If the top few inches of soil feels dry, wet the soil deeply, to at least a depth of 6 to 8 inches. Use soaker hoses or drip irrigation to slowly water the base of the plants. Overhead irrigation may promote disease. Fertilising: Azaleas have low nutritional requirements compared to other shrubs. A soil amended with organic matter prior to planting followed by a mulch of compost, shredded leaves, pine straw or other organic material will usually provide sufficient nutrients for adequate growth. Before fertilizing, have a specific reason for doing so, such as increasing growth rate or correcting a nutrient deficiency. A nutrient deficiency can be exhibited by a number of symptoms including stunted growth, smaller than normal leaves, light green to yellowish leaf color and early leaf drop. Be aware that these same symptoms can be caused by other problems such as heavily compacted soil; stresses from insects, disease organisms and weeds; and excessively wet or dry soil. Fertilization will not correct those problems, so find out the cause of the symptoms and treat them appropriately. The best time to apply fertilizer is when it will be readily absorbed by the roots of the plant and when the soil is moist, which can be any time from late spring (after new growth emerges) up to early fall. Avoid fertilizing plants stressed by drought during the summer months. Without water, plants are unable to absorb nutrients, so it is best not to fertilize if water is unavailable. Pruning: There are two pruning techniques used for azaleas: thinning and heading. Thinning refers to the removal of branches back to the main trunk or another branch. This method is used to remove leggy branches that extend beyond the canopy of the plant, remove damaged or diseased wood, or reduce the size of the plant. Thinning allows light to penetrate the shrub, encouraging growth on interior branches. Thin the plants at any time of the year without causing significant impact on flowering, growth or cold hardiness of the plant. How-ever, to reduce the impact on flowers the following year, prune just after flowering in the spring. Heading refers to the cutting back of a branch, not necessarily to a side branch. This method is used to reduce the size of a plant, create a hedge or to renew old overgrown plants. Renew overgrown plants by cutting them back to within 15-30cm (6 to 12 inch) of ground level. This practice results in abundant new growth by midsummer. The best time to renew azaleas is before spring growth begins. This allows sufficient time for next year’s flower buds to form in midsummer, and for new growth to mature and harden off for winter. Propagation: Azalea indica ‘Inga’ is usually propagated by 7-10cm (3–4-inch) cuttings taken after the spring growth has hardened or matured. They are also easy to root using different layering techniques. Uses: Exceptional early spring color for beds, borders and foundation planting. Add to perimeter plantings. A natural large tree groves and the verges of wildlands or naturalistic landscapes. A traditional choice for Asian inspired gardens. Bold color for reflecting pools and water gardens. Companion Plants: Group this vivid azalea with other acid loving plants such as Normandy Rhododendron, (Rhododendron x ‘Normandy’), Seiryu Japanese Maple, (Acer palmatum ‘Seiryu’), Orangee Flame Oregon Grape Holly, (Mahonia aquifolium ‘Orangee Flame’) and Makinoi’s Holly Fern, (Polystichum makinoi). Azalea indica ‘Inga’ is also suited for hanging baskets. Azaleas have a particularly good effect on ammonia found in floor cleaning products, so these plants are very valuable when grown indoors. 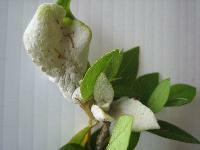 Lace bugs, spider mites, leafminers / leafrollers, and azalea caterpillars are the most common pest problems for azaleas. Lace bugs are sucking insects that feed on the undersides of leaves. The top surface of the injured leaf appears speckled or mottled, and tiny black spots of insect excrement can be seen on the leaf undersides. Treatment: Mid-spring is a great time to control these infestations. Insecticidal soap, horticultural oil, neem oil and most synthetic insecticides will kill the insects. The key to good control, though, is thorough coverage. Use a garden sprayer and pump it up vigorously. When spraying, point the spray wand up from beneath so the undersides of the leaves are covered with spray. Another pesticide option is to use a systemic insecticide that poisons the sap of the azalea. Imidacloprid (Bayer Tree and Shrub Insecticide) can be poured around the roots of azaleas in spring, when growth begins, to achieve season-long control. The most common diseases reported on azaleas include petal blight, leaf and flower gall, and various azalea declines. 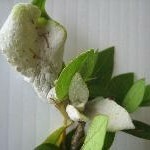 Petal blight is most severe during cool, wet spring weather. Infection first appears as small, white spots on colored petals or rust-colored spots on white-flowered varieties. Spots enlarge rapidly into irregular blotches, causing the blossoms to “melt” into a slimy mass. Affected blossoms dry and either drop or remain on the plant. The fungus survives on dried blossoms on or in the soil. Prevention and treatment: Removing mulch and dead flowers 3–4 weeks before bloom reduces disease incidence. Avoid overhead watering. Apply all chemicals according to directions on the label.